Goethe‘s Faust tells a myth that originated with the life of Simon Magus, a Gnostic who died in Rome while attempting to fly — at least one account indicating he “flew” with an intention to destroy his own body. The German rockers Faust had an approach not so very different from Simon Magus. Faust were more than willing to break from all the commercially viable music of the day. Screw the usual consequences. Isolating themselves in a converted schoolhouse in Wümme, the group recorded the album in three days to satisfy their record label. In doing so, Faust moved towards something confounding by conventional standards, but they did so with an offhand charm that is very special. Mechanized rhythms appear, then melt away. Melody is faint. They include snippets of other music (like The Beatles’ “All You Need Is Love” and The Rolling Stones‘ “(I Can’t Get No) Satisfaction”), with the opening segment of “Why Don’t You Eat Carrots” sounding like tuning in a radio to different channels (like Kurzwellen, Hymnen, “Program” from Silver Apples, or “Radio Play” from Unfinished Music No. 2: Life With the Lions) amid waves of static. The music unfolds at a lethargic pace. This stands in contrast to the industrial sounds the band makes. Industrial society is usually about efficiency, and that tends to mean speed and precision. That is sort of the crux of this (anti-)music: it has a contrarian way of turning music of an industrial age into almost pastoral collection of vague non sequiturs. The album self-consciously tries to be different (perhaps The Residents‘ Meet the Residents is a rare attempt to follow-up on this style of music). Faust’s later work is better, but this debut still stands as a defiant remnant of the tail end of the psychedelic era, when it seemed like the world could be reshaped in new and unexpected ways. If lots of the hippie stuff of the late 1960s got co-opted, Faust is one album that resists assimilation more than most. 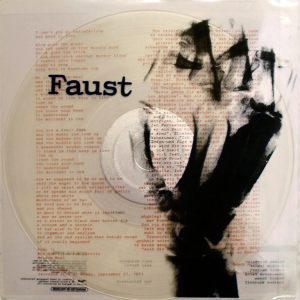 The packaging of this album also bears mention for its uniqueness: a clear vinyl record in a transparent sleeve showing a x-ray of a clenched fist (the word “faust” means “fist” in German), with a transparent lyric sheet. It captures well the spirit of the music it contains. One of the least interesting of Dylan’s pre-Desire albums. 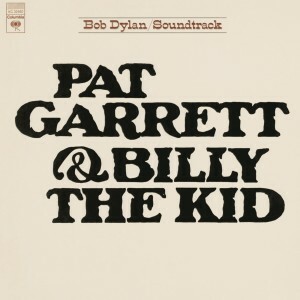 The opener “Main Title Theme (Billy)” is fairly good, and there is the classic “Knockin’ on Heaven’s Door” (though Television‘s live version on The Blow-Up is probably superior). The rest of this mostly instrumental music, well, offers very little. Dylan is surprisingly winsome and even new-age in his sound. It really doesn’t work. Sometimes soundtrack music is worthwhile only in the context of the movie. Sadly, this didn’t even work there. 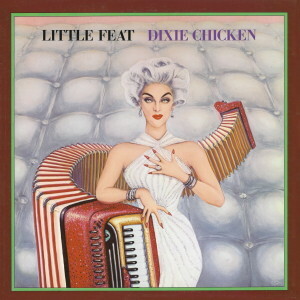 All things considered, Dixie Chicken is probably the best place to start with Little Feat. The group’s sound was well defined by this point. The eccentric characters and stories of “Dixie Chicken” and “Fat Man in the Bathtub” sit well with the nice ballads “Roll Um Easy” and “Fool Yourself” and the increasingly boogie-rock oriented material like “Two Trains” and “Walkin’ All Night.” Lowell George, the group’s star and best songwriter, guitarist, and singer, was still a major force on this album, before he started to fade away from the spotlight in the coming years. From here, go back to the previous album Sailin’ Shoes, which is more eccentric and is even better, or, if the slicker, more boogie-oriented stuff is more to your liking, head for Little Feat’s next album Feats Don’t Fail Me Now. When I was involved with college radio, there was a very explicit idea conveyed to everyone at the station that you needed to play music outside of what you could hear on typical commercial radio. Whenever classic rock or 1970s rock in general was mentioned, Little Feat was a common example of what was okay to play, as being a band generally overlooked. This always caught my attention, because in high school I had come across Little Feat and a few of their records that I had were favorites that I played over and over. Now, I don’t mean to imply that classic rock stations didn’t play Little Feat — I had heard “Dixie Chicken” on the radio before, on a rare occasion, but that was only when a station had some kind of marathon event where it played one song by every artist in its library. The basic point here is that Little Feat never quite clicked with a huge audience for whatever reason. But they clicked with me early on. Fast forward quite some time and I find myself still listening to and enjoying the music of Little Feat. This was the album that wasn’t SMiLE. After Pet Sounds, Brian Wilson set out to create the greatest album ever. His comic masterpiece was to be SMiLE. For an enormous list of reasons, that project was scrapped before it could be finished. Brian Wilson ended SMiLE (resurrecting it in 2011 with The SMiLE Sessions). But not before a select few had heard some outtakes and confirmed the project’s great promise. 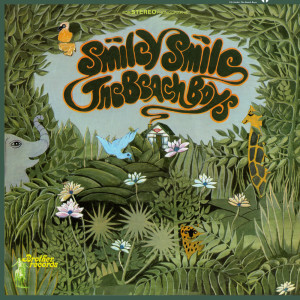 The actual follow-up to Pet Sounds was Smiley Smile. Some of the material intended for SMiLE made its way to Smiley Smile by way of new recordings. Where SMiLE was to find humor in all existence, Smiley Smile made a concerted effort to under-produce the material from SMiLE to make it bleak and impenetrable. The constant tension makes it is obvious how the songs consciously departed from their origins. This was the Beach Boys at their most experimental. Every song risks being unpopular. “Fall Breaks and Back to Winter (W. Woodpecker Symphony)” is quite amazing as a composition though, despite its references to a cartoon, it certainly would scare most small children. “Heroes and Villains” comes pieced together out of a number of disparate ideas (it was to be the centerpiece of SMiLE at 11 minutes or so). It still is one of the disc’s great achievements in recalling a failure to break the ties of good and evil. “Good Vibrations” appears intact. It was previously released as a single, and simply found its way onto the next album. It is a classic. Physical vibrations (or drugs) give rise to sensation in the mind. The song addresses with unparalleled detail both the physical and mental as distinct but inseparable elements. Paul McCartney even provides one of the most bizarre cameos you’ll ever encounter. “Vegetables” features a percussion track of McCartney and Brian Wilson chomping on celery. The song begins as a sparse, almost entirely vocal, track, then builds into a layered production that ends before it goes far. And don’t miss “Wonderful”! Smiley Smile is both a triumphant vision and that vision’s own demise. Brian Wilson seemed a bit of a madman making it. It is the paradox at the heart of his efforts that make this so important. In a perverse way, people should thank Brian Wilson for destroying SMiLE. In destroying those recordings he established a continuing desire for everyone else to try themselves. Streeck’s comments about inflation might be questionable. Here is an album for which its greatest strength is a sense of indifference, with the most recognizable features resembling an aftertaste. 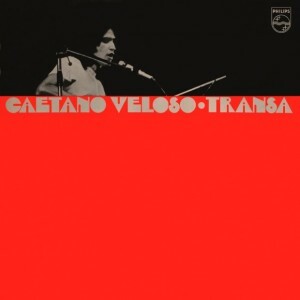 Caetano Veloso seems distant on Transa. The music has lyrics that are ostensibly personal, but the music throws together many different styles, from different cultures and geographies, rather carelessly. This stands in contrast to Veloso’s own description. He considered it very deliberate, an album that reflected what he tried for. Veloso has named this as a personal favorite of his own work. This also frequently is named one of the best Brazilian rock albums. The folk-rock of Richie Havens‘ Richard P. Havens, 1983 (1969) seems a fair comparison, though Veloso is inherently more musical in how quickly he shifts from one sound to the next and how disparate and diverse his influences are. Perhaps even Love‘s Forever Changes (1967) is a fair comparison too, if nothing else because of the sense of inward reflection and the confluence of disparate styles. But Transa is a more fluid mashup. For instance, the opener “You Don’t Know Me” suddenly shifts from a mellow guitar line to a quickened pace interrupted by a stark and haunting ascending chord progression lifted from Hendrix‘s “The Wind Cried Mary” on electric guitar, then back to the opening pace, then driven to more intense singing bolstered by propulsive drumming, then by the end of the song the rockish instrumentation is dominated by flamboyant acoustic guitar noodling that inverts the buildup, allowing the song to wrap up with staccato rhythms that blend all the instruments together with Caetano singing in his most didactic and dramatic tone like a deathly serious European chanson à texte or poezja śpiewana singer. The epic progression of the song is completely undersold, especially the way the very conclusion of the song seems to be an unresolved melodic figure, yet it is also the crux of how the song works. You might say this is a completely existential album. Albert Camus in “The Myth of Sisyphus” wrote, “There is but one truly serious philosophical problem, and that is suicide. Judging whether life is or is not worth living amounts to answering the fundamental question of philosophy.” For Camus, this meant embracing the absurd, unreasonable world, without any guarantee of meaning, and accepting the need for revolt, freedom, and passion in the face of absurdity. That is more or less what Caetano attempts here, privileging nothing and holding out no hope of any kind of transcendence. This is, ultimately, what separates Transa from Richie Havens, Love, or any of the hippie artists of the North Atlantic region. The song “Neolithic Man” has the lines “I’m in the silence that’s suddenly heard / After the passing of a car.” What is this nonsense! Indeed! This is an album that requires acceptance that Caetano will ramble on about listening to reggae music and what nine out of ten movie stars will make him do (answer: cry), then turn to bongos and kitschy bass lines on a song that is a dirge for his home state in Brazil — he casually asserts that any music, commercial or artistic, can be used to make any point, all without any overt claims to experimentation with form or content. Such acceptance does not come so easily. And so, Transa may not be immediately appealing. Yet it is an album for which an appreciation can grow. I still prefer Veloso’s second self-titled album (AKA Álbum branco) from 1969, but Transa is nonetheless another excellent platter. What to make of this? 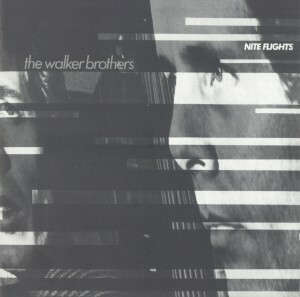 The first four cuts are by Scott Walker, and they are pretty good — especially “The Electrician,” which is an unclassifiable melange of gothic classical, pop crooning, rock and more. The rest of the album borders on the unlistenable. Nothing balances out in the end. 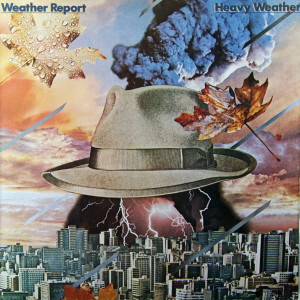 “Sellouts,” “boring,” “pandering,” “overly slick,” “crassly commercial,” “unchallenging.” You’ll find all those criticisms and more about Weather Report. At least with Heavy Weather they are pretty much all true. Yet you’ll hardly find more well-played schlock anywhere. 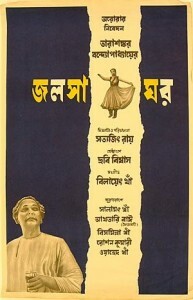 Satyajit Ray was a director who mostly followed the lead of cinema in other countries. The Music Room is basically an Indian re-make of Sunset Boulevard (1950). It is the story of a Raj (Chhabi Biswas) who admires music, but whose royal estate has dwindled due to some sort of flooding (the explanation in the film is cursory and implausible). He is nearly broke. A nouveau riche moneylender (Gangapada Basu) arrives and as a matter of pride the Raj spends the small remainder of his funds on a concert held in his palace music room, to show up the businessman and assert his hereditary superiority. The culmination of the film is a lengthy music and dance performance. But the best individual moment is perhaps when a servant is shaking incense or something at the concert guests, and when the businessman recoils the servant makes a point to shake some more of it at him. The film suffers from having no likable characters. The aging Raj seems like a fool, and the sniveling businessman is insufferable. The servants and musicians offer no significant independent perspective in the film. Most significantly, though, the film’s exploration of social class is considerably less daring when set in a caste-based society than when Sunset Boulevard explored class conflict and social prestige in a society that denies the existence of class. The Music Room takes much too much for granted in casting archetypes: the Raj, the moneylender. As a study in the vices of pride and hubris, this doesn’t offer much in the way of depth. But the big musical number has its own value independent of the film.